A bunch of Close to My Heart consultants have gathered together once again to bring you a blog hop featuring the papers in the brand new Dotty For You Paper Packet. The hop makes a circle so if you are starting here, continue until you make your way back. If you are coming from Haley Dyer’s Blog you are on the right track. Supplies used are Close to My Heart unless noted: Dotty For You Paper Packet, Colonial White Grosgrain Ribbon (retired), Colonial White RicRac from the Colonial White Designer Ribbon Round Collection, Basic Buttons Assortment, Bamboo Waxy Flax, Dimensional Elements – Hearts, Heavenly Blue ink, Smoothie ink, and DCWV Quote Stack. I just love all the different colors that this paper pack has in it. You can do many layouts and they will all look so different! 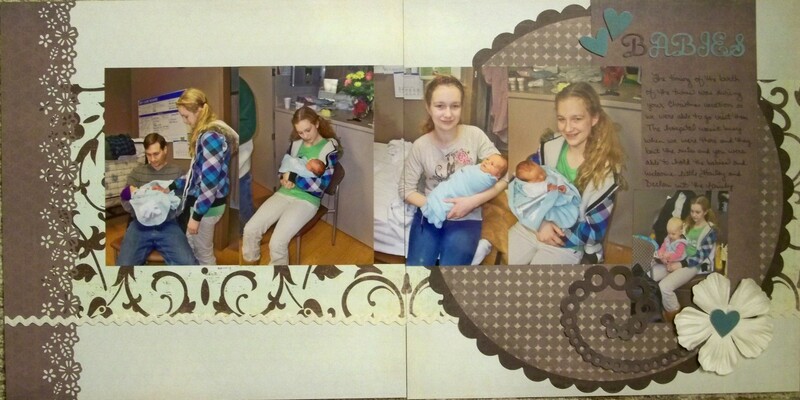 I really don’t care for the cloud paper and thought for sure it would be one that I would use the backside of but what do you know here it is showing up on my layout and it is perfect for these baby pictures! My layout is also a copycat from the Studio J layout below. I noticed the row of stitching and substituted it with ric rac. I really like the mix if it with the line of ribbon. Your next stop is Elizabeth Mindemann’s Blog. I was so busy in February with my new Close to My Heart products that I really didn’t dig into my stash at all. I’m hoping to do more this month but I can’t believe we are already halfway through! My personal stash buster for March is chipboard so I hope you will be seeing a lot of it. My basket is overflowing so my goal is that it will be more manageable by the end of the month. Supplies used: Crate Paper Prudence Collection Kit, CTMH Colonial White Ricrac, Martha Stewart border punch, Recollections floral embellishment, and chipboard hearts. October 2011 Page Map sketch. I don’t think this is a bad layout but I would agree with Christine “it’s not your best Mom”. It was fun to pull out some different papers to use. 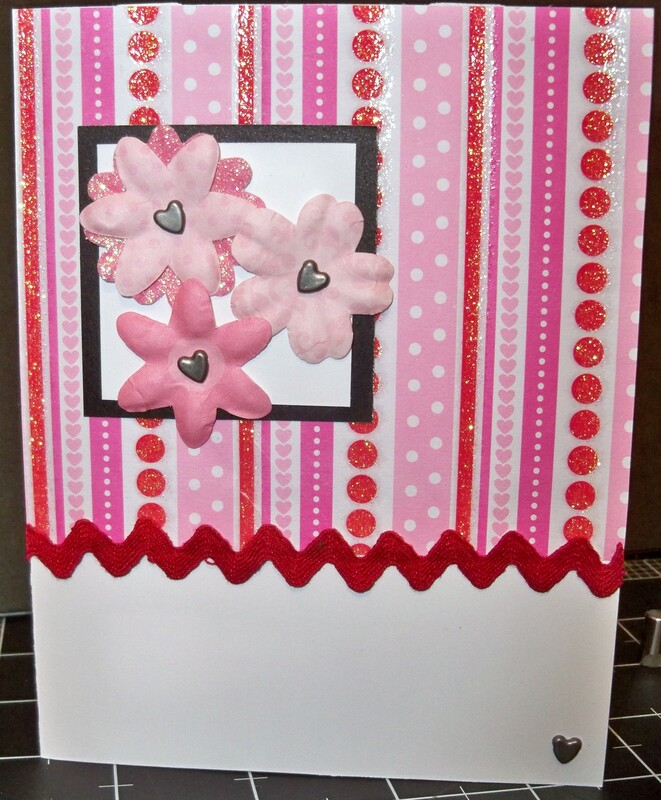 I made sure I used chipboard on the layout and the hearts turned out to be a nice (different for me) addition. Supplies used: unknown pattern paper, Technique Tuesday scalloped baseboards, layered title by Colorbok, Making Memories Rose Petal Paint, Making Memories Rose Petal Specialty Glaze, CTMH Sparkles, Making Memories flowers, unknown ricrac, and eyelets. Based on a Becky Fleck January 2011 Page Map sketch. 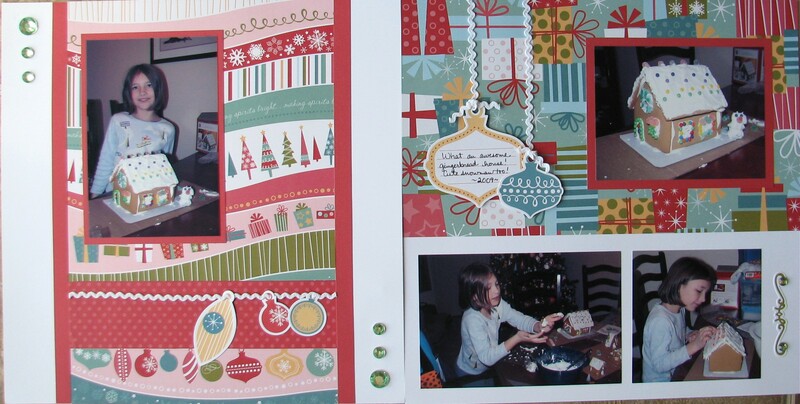 Scrap Our Stash February Challenge. 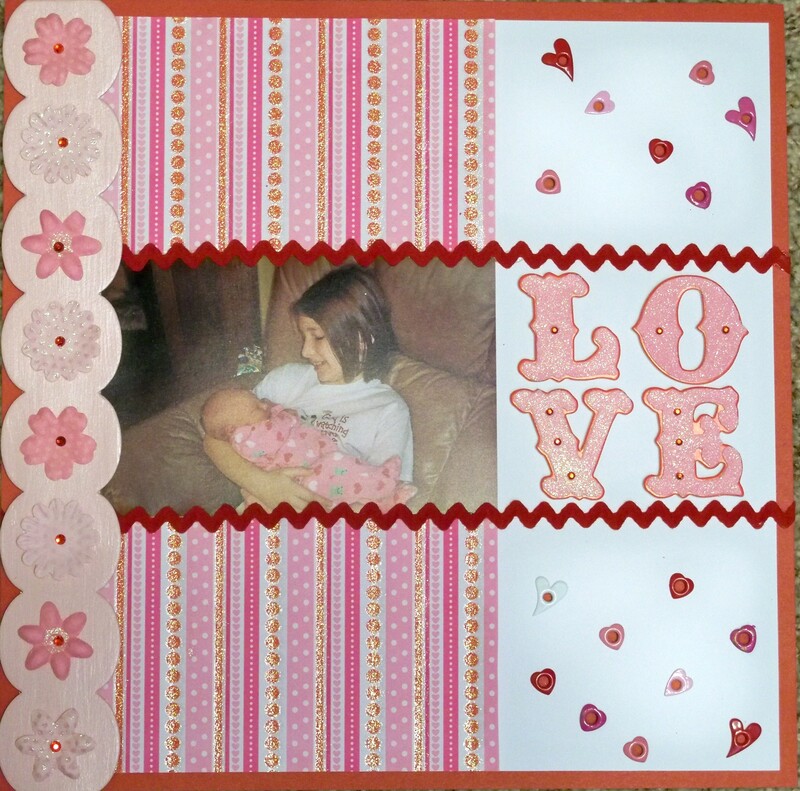 The February Challenge at Scrap Our Stash this month is LOVE. I really dug into my stash for this layout. I think the patterned paper may have been from the Target Dollar Spot at least a year ago, the scalloped baseboards are from when a local scrapbook store closed years ago, and the eyelets and brads are even older. The ricrac is from a bag I found at a rummage sale! I am not one for empty space on a layout or just plain cardstock so I filled the white cardstock space with heart-shaped eyelets to create my own patterned paper. I painted the chipboard border with a pink base topped with a coat of specialty glaze. Layout Challenge: #123 of 210. Can you see the pattern? I was really working hard to use up this pack…CTMH Jingle papers & stickease, White Daisy ricrac (are those hanging ornaments cute or what! ), 3D foam tape, and Kaiser rhinestones.